The Unified clothing and skin (metal and tessellate) shader is a shader used for adding depth and substance to your clothing and skin. This shader is best used on high end machines. You can use Unified Clothing and Skin shader if you have a PC with lower performance. To use this shader on your clothing and skin items, search for Unified Clothing And Skin (Metal and Tessellate) in your Unity project window. Create a new material by right clicking in the project window and select 'Create>Material'. Drag the Clothing and Skin (Metal and Tessllate) shader on to the new material and this will add the shader to the material. This shader has all the same settings as the normal Unified clothing and skin shader. Main Color - Sets the overall color of the skin. Specular Color - Tints specular highlights of the skin. Shininess - Sets the shine amount of the skin. Rim Power - how rim lighting spreads around the edges of the model. Rim HDR - Adds a boost to rim lighting, to enable it push into HDR values (i.e. Brighter than white) for bloom. Tessellation - allows DX11 Tessellation which smooth's geometry when camera is up close. Specular Amount - Sets the specular amount. Gloss Amount - Sets how glossy the skin should look. Smoothness - controls specular highlights on PBR platforms (higher = tighter highlights), correlates with Standard shader. 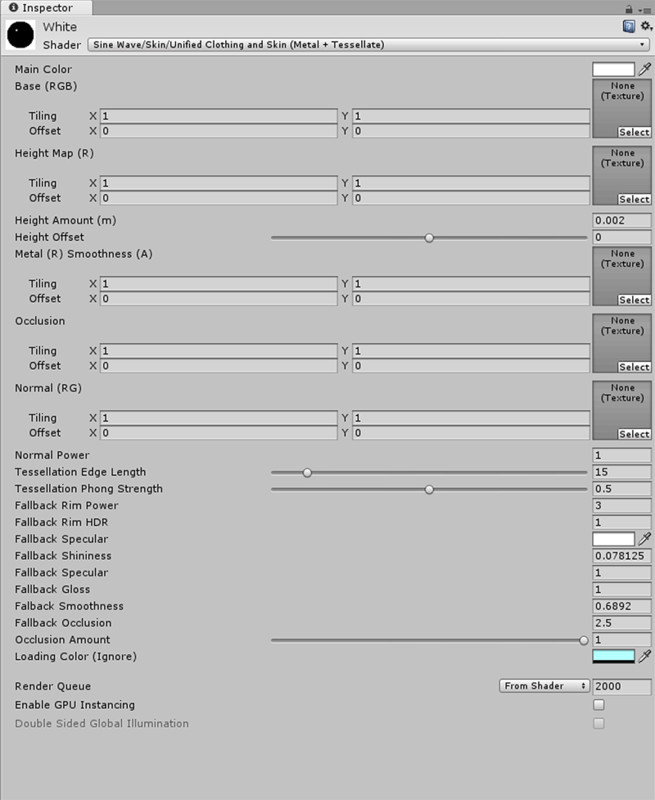 Occlusion - controls ambient occlusion. Loading color - For internal use. PLEASE IGNORE THIS SETTING. - Single channel (R) texture with height distances encoded on it, you can use a heightmap exported from your 3D package (either Quixel/Substance Painter or from Maya/Max/Blender) - should be derived from the same thing building the normal maps. Use the height map for encoding fine details (such as for example complex textured fabrics) that are too small or high poly to justify using actual geometry. - How much in meters to scale the model details by the heightmap. A value of 0.01 is 1cm. Typically you want 0.005 or so. - This will subtract this value from the heightmap values uniformly; you can use for tweaking the visual appearance. Note: resulting values less than zero are treated as zero. - This defines the maximum size of a triangle on screen in pixels. If a triangle is larger than this many pixels on screen, it will be subdivided. Do not go below 15. What if I need a...?